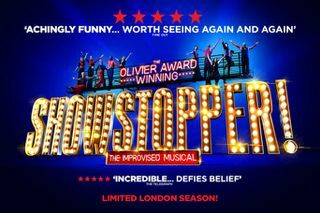 Winning the 2016 Olivier Award for Best Entertainment & Family Show, The Showstoppers has returned to create even more spontaneous musicals! A huge success at the Edinburgh Fringe and a regular visitor to the famous festival, Showstopper – The Improvised Musical has now found a new audience in London and looks forward to performing for eight weeks of singular, one-night-only musical extravaganzas. Approaching their 1000th performance, every Showstopper! performance is a brand-new musical West End hit waiting to happen – so don’t miss out! Seven performers take part in a performance of Showstopper, from a rotating troupe of actors including Ruth Bratt, Justin Brett, Dylan Emery, Pippa Evans, Susan Harrison, Sean McCann, Adam Meggido, Philip Pellew, Andrew Pugsley, Oliver Senton, Lucy Trodd and Sarah-Louise Young. You, the audience, have the idea for the show! The Showstoppers create an all-singing, all-dancing show from the crowd’s suggestions, ranging from political uproar to reality television disasters. It’s an unpredictable and hilarious evening of musical improvisation, making each show unique. It’s a must-see! LOOKING FOR CHEAP SHOWSTOPPER! THE IMPROVISED MUSICAL TICKETS AT THE OTHER PALACE? With our huge range of cheap musical tickets, London shows have never been better value. Book with us for Showstopper! The Improvised Musical and enjoy great entertainment at a price that’s in tune with your budget. Where is Showstopper! The Improvised Musical?